There are many reasons to join AOR. 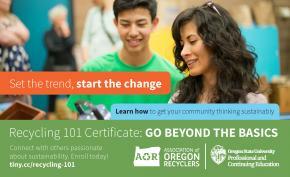 Your membership supports the most significant voice of recycling advocacy in Oregon and makes you part of a large and resourceful network of people and organizations that work together to forward recycling practices and policies around the state. Quarter 1 (Jan-Mar) – 75% of the membership fee. Quarter 2 (Apr-Jun) – 50% of the membership fee. Quarter 3 (Jul-Sept) – 25% of the membership fee. Quarter 4 (Oct-Dec) – 100% of the membership fees. STUDENTS CLICK HERE TO JOIN! Individual members receive: discounts to AOR events; all email publications and communications; and access to the members-only area of the website. Student (enrolled full-time in any higher education institution - nonvoting) - FREE! CLICK HERE TO JOIN! All organizational members receive up to four contacts. These contacts receive: discounts to AOR events; all email publications and communications; and access to the members-only area of the website. Organizational members may add additional contacts to their accounts for $25 per contact.